Well, the "public" part of my first Cybils panel is over! I have reviewed all 39 of the books nominated in this category. Phew! Shortlists will be announced January 1st, so that's something to look forward to, and I still have lots of book discussing to do with my fellow panelists! Here is the grand list of titles and reviews. Thanks to all the publishers and authors who supplied review copies - I've also listed where they are going after we finish our weighty deliberations! I'm posting this in the interests of full disclosure and because I like to make lists. 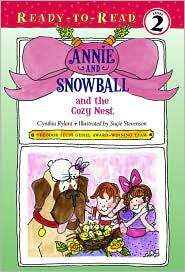 Annie and Snowball and the cozy nest by Cynthia Rylant. Review copy supplied by publisher, donated to library. Birthday for Bear by Bonny Becker. Borrowed from my library. Cork and Fuzz: Finders Keepers by Dori Chaconas. Borrowed from my library. 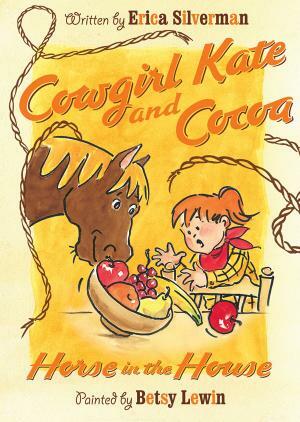 Cowgirl Kate and Cocoa: Horse in the house by Erica Silverman. Review copy supplied by publisher, donated to library. 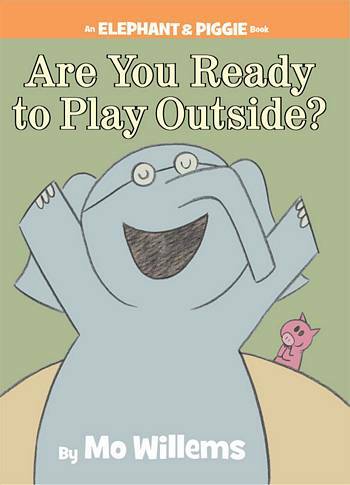 Elephant and Piggie: Are you ready to play outside? 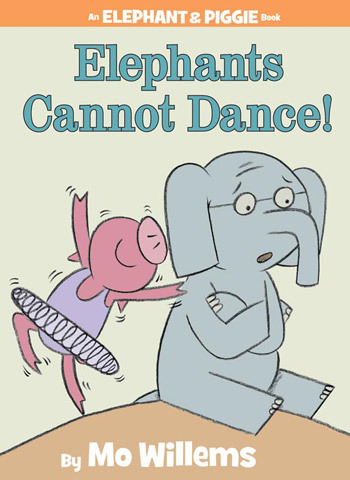 Elephants cannot dance. Watch me throw the ball! by Mo Willems. Review copies supplied by publisher, donated to library. Fancy Nancy and the dazzling book report by Jane O'Connor. Borrowed from my library. Flamingos by Jean Malone. Review copy supplied by publisher, donated to library. 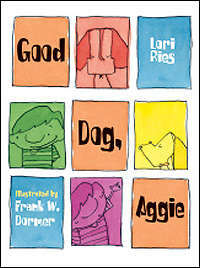 Good dog, Aggie by Lori Ries. Review copy supplied by publisher, donated to library. 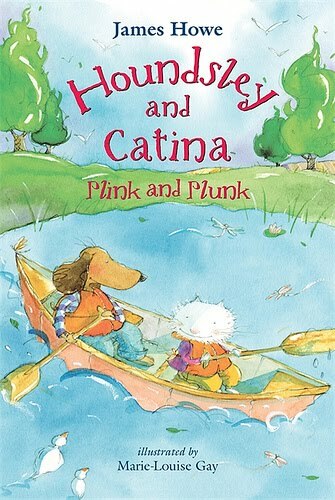 Houndsley and Catina: Plink and Plunk by James Howe. Borrowed from my library. 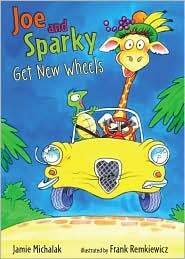 Joe and Sparky get new wheels by Jamie Michalak. Borrowed through library consortium. Katie Woo: Goodbye to Goldie by Fran Manushkin. Review copy supplied by publisher, donated to library. Max Spaniel: Dinosaur Hunt by David Catrow. Review copy supplied by publisher, donated to library. 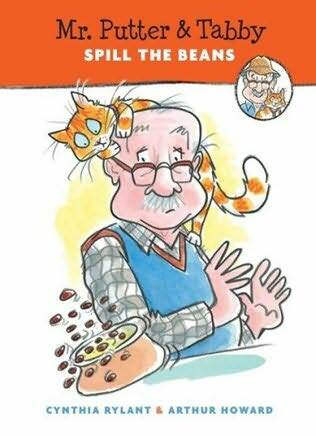 Mr. Putter and Tabby spill the beans by Cynthia Rylant. Review copy supplied by publisher, donated to library. 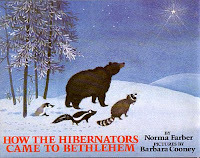 No room at the inn by Jean Malone. Review copy supplied by publisher, added to summer reading free books stash. Shampoodle by Joan Holub. Review copy supplied by author, added to summer reading free books stash. Snow Wonder by Charles Ghigna. Borrowed through library consortium. Alice's Shooting Star by Tim Kennemore. Review copy supplied by publisher and kept by me b/c I already got this for our library and I just adore Alice! Amazing trail of Seymour Snail by Lynn Hazen. Borrowed through library consortium. Backyard Sports: Hand-Off by Michael Teitelbaum. Review copy supplied by publisher, added to summer reading free books stash. Bait for lunch by K. A. Okagaki. Review copy supplied by author, added to summer reading free books stash. Chasing George Washington adapted by Ronald Kidd. Review copy supplied by publisher, added to summer reading free books stash. Down Girl and Sit: Bad to the Bone by Lucy Nolan. Review copy supplied by publisher, donated to library. Field Trip Mysteries: The painting that wasn't there by Steve Brezenoff. Borrowed through library consortium. Gruffen by Chris D'Lacey. Review copy supplied by publisher, donated to library. Harley Quinn's Shocking Surprise by Blake Hoena. Review copy supplied by publisher, donated to library. How Oliver Olson changed the world by Claudia Mills. Borrowed through library consortium. Keena Ford and the second-grade mix-up by Melissa Thompson. Borrowed through library consortium. Last Castaways by Harry Horse. Borrowed through library consortium. Magical Ms. Plum by Bonny Becker. Borrowed through library consortium. Mercy Watson: Something wonky this way comes by Kate DiCamillo. Borrowed from my library. Mozart in the future by Tania Rodrigues-Peters. Review copy supplied by author, added to summer reading free book stash. Nana cracks the case by Kathleen Lane. Borrowed through library consortium. Penny and Rio: the locked doghouse mystery by Jennifer Swanson. Review copy provided by author, added to summer reading free books stash. Peter Peter picks a pumpkin house by Christine Graham. Borrowed through library consortium. 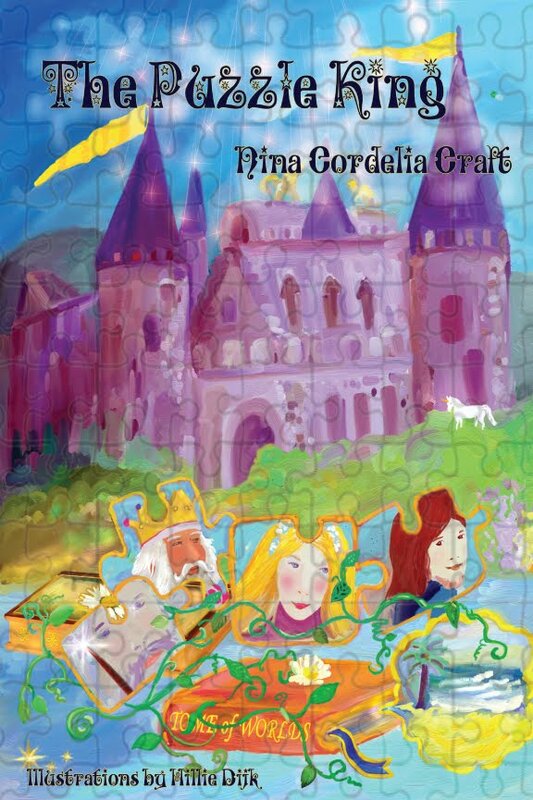 Puzzle King by Nina Cordelia Craft. Review copy provided by author, added to summer reading free books stash. Roscoe Riley Rules: Never race a runaway pumpkin by Katherine Applegate. Borrowed from my library. Zac Power: Poison Island by H. I. Larry. Borrowed through library consortium. Today, (ok, this evening. whatever) I'm looking at two books I really didn't expect to like or be interested in at all. But I was surprised and delighted by their awesomeness. 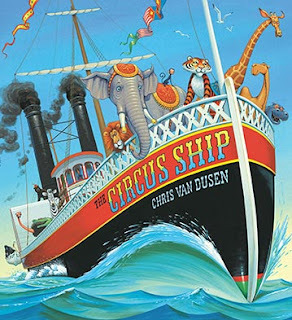 First, Circus Ship by Chris Van Dusen. Now, I know you are saying, "what? how can you not be a fan of the brilliance which is Dusen?" but my only exposure to this exuberant artist was through the one Mercy Watson book, which I read and reviewed for Cybils. You can probably sense a little "these pictures are cool, but what are they doing in a chapter book?" vibe going on there. Anyways. So, several people raved about Circus Ship, and it was on the front of the publisher's catalog and all, but somehow the cover just didn't really grab me. Plus, I had found out it rhymed. I am always suspicious of picture books that rhyme. So I waited until another library in our consortium had bought it and I borrowed it....and was wowed. 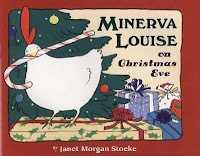 The text has the perfect cadence and rhythm for reading aloud. Not too long, not too short. 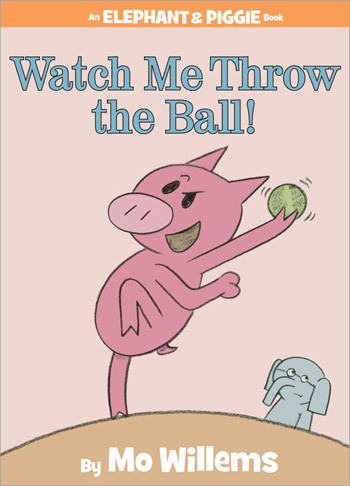 The rhymes are natural and unforced and skillfully weave dialogue and narrative together. The illustrations....ooooh. Van Dusen's glorious colors are all here, gleaming, sparkling, exploding off the page, even when dimmed by storms and menaced by evil villains. The slightly retro feel of the art skilfully gives the illustrations a realistic historical feel while the exuberant animals and bemused villagers place this fictionalized account of a real event firmly in fantasy land. Verdict: Highly recommended, added to my order list, and onto the storytime roster! The second story is a complete change of pace. I glanced at a few reviews for this and thought scornfully "we don't need any more memoir picture books, let the adults buy them for themselves. I buy books for kids". Plus, although I loved and read often Lowry's Number the Stars, I was deeply scarred by the forcible reading and truly puerile discussion of Lowry's Giver in an unbelievably boring and infantile "children's literature class" in college. Let me simply say that the professor had previously taught third grade and leave it at that. At least it gave me an idea of what high school students suffer in literature classes *shudder*. Anyways. But the more positive reviews I saw, the more I thought "well, I should at least look at it." So I looked at it and was entranced. This picture book is definitely for older readers and listeners. The lengthy text and nuanced narrative will be difficult for preschoolers or even kindergarteners to follow. But older children who have the patience for a longer story and an appreciation of language will be a rapt audience for this book. The story is evocative and emotional, although the language is plain and almost stark. A small girl tries to reconcile her memories of her father with the stranger who has returned from war. Together, she and her father rebuild their relationship and reconnect. 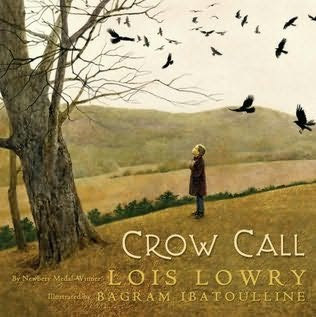 Simple and yet deeply moving, capturing the pain of separation, the fragility of family relationships, and the wonder of the natural world. The pervasive browns, greys, and strong earth tones of the illustrations recreate the somber landscape of early winter but manage to thread the hope of returning life and joy throughout the story. Emily Gravett always manages to surprise me. I couldn't wait any longer to see her newest picture book, Spells, and requested it from another library. It's just....fascinating! Let's see, how can I describe this without giving anything anyway? A little green frog with a big imagination finds a magical surprise. The reader gets an even bigger surprise after choosing the best ending for the.....frog? 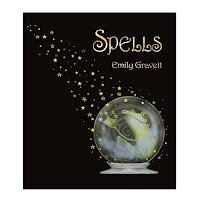 Another marvelous Emily Gravett masterpiece, complete with sly puns, unique construction, clever illustrations (take a close look at the black background in the light) and final delicious touch. Verdict: If your library is firmly against any kind of flaps or "novelty", this won't be wanted, but try to get it anyways. Delightful fun! In addition to re-reading all the Hardy Boys mysteries, I am reading with rapidity through the piles of accumulated library books stacked about my shelves. Here's a collection of fairy tales and myths I've been saving up to read and review. This new version of Persephone, retold by Sally Pomme Clayton and illustrated by Virginia Lee has gorgeous illustrations but the text felt a little thin to me. It's a fairly simplified version of the myth with no reconstructions or additions. There's a short epilogue about how the myth - and pomegranates - figure in Greek society today. I scooped up this version of Thumbelina retold by Brian Alderson and illustrated by Bagram Ibatoulline because I enjoyed the illustrations in Lowry's Crow Call. The retelling is excellent, keeping the flavor of Andersen's original story while using updated and accessible language, but I was disappointed by the illustrations. Thumbelina, for some reason, made me think continously of Alice in Wonderland. Lisbeth Zwerger's illustrations remain my favorite. 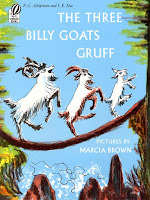 I've been looking for the "right" version of Three Billy Goats Gruff, the story I remember from when I was a child, and I'm pretty sure I've found it! It's the original story, complete with gory threats and troll-destruction at the end and full of Marcia Brown's colorful and vivid illustrations. Sensitive parents may be horrified by the terrifying troll and his even more terrible fate, but if you choose to tell this story instead of reading it, you can soften the ending, depending on your audience. 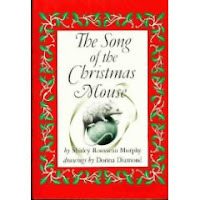 There's a reason this is a classic folk tale; it has a wonderful cadence and this is a great retelling. 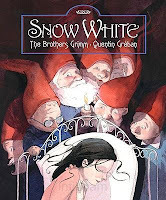 I don't remember where I heard about this new version of Snow White but it's a lovely one. I love North South publisher's works (except for Pfister, but that's a whole 'nother issue) and this lovely fairy tale is no exception. Greban's illustration are lively and warm, perfectly complementing the original tale. Which, I am pleased to say, is included in its entirety, from Snow White's begging the huntsman for her life to the wicked queen's gruesome end. Finally, I have an old tale illustrated by Bernadette Watts. The Snow Queen was gorgeous; I am putting this on my wishlist of books I want for myself. 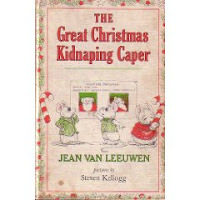 Some parts of the story have been changed; I missed the full explanation of Kay's challenge with the ice blocks and felt that most of the flavor and personality of the little robber girl had been smoothed away, but the splendid beauty of the illustrations more than makes up for any minor deficiencies in the text. For those not familiar with the Snow Queen, it's a long and somewhat complicated quest tale, similar to East of the Sun, but full of Andersen's characteristic storytelling genius. Two more Polo books! I've very fond of these almost wordless picture books whose stories are told in comic panels. I am still secretly planning to buy the rest of this series for the library and move them out of picture books and into juvenile graphic novels to sit next to Owly. I think Polo and Owly could be good friends. 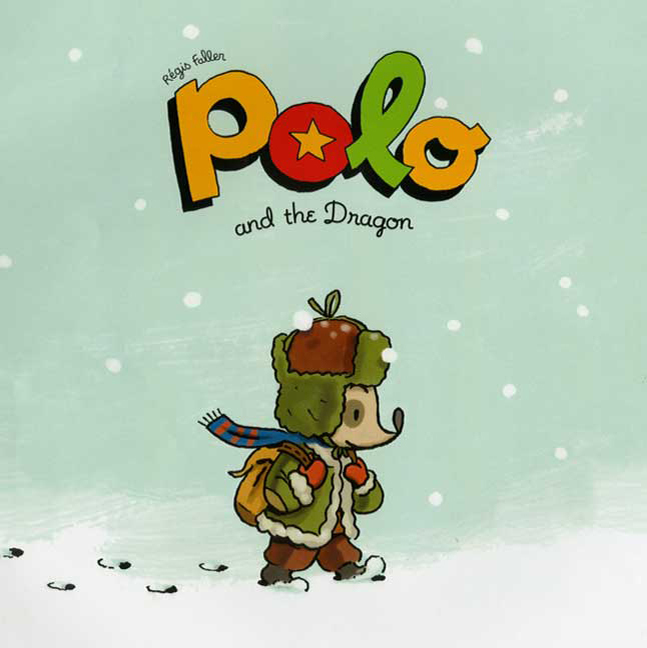 I loved Polo and the Dragon - it's the funniest one I've read so far and I was delighted to see some sentient art ala Harold in this story of unexpected weather and even more unexpected meetings! Polo and the Magician wasn't one of my favorites - I couldn't decide if the Magician was being mean or not and he seemed kind of scary. Maybe because the colors seem to be a little darker in this one. 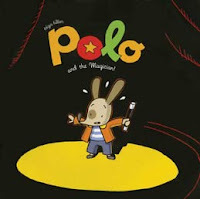 Verdict: Polo is great fun if you want to introduce young children to comics, like sly humor and delightful imagination, or enjoy simple adventures that end at home. Daisy by Elizabeth Coatsworth, illustrated by Judith Gwyn Brown. 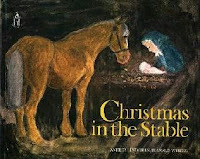 Published in 1973, this little book is only 69 pages and full of Brown's evocative black and white sketches. But it's no beginning chapter book. The vocabulary and complex plot would be considered "too difficult" for today's beginning readers. If you, like me, are an Elizabeth Coatsworth fan and have read her fascinating and layered autobiography, Personal Geography, you'll recognize this as a story from her childhood. Daisy, the youngest of two sisters, is shy, awkward, and timid about trying new things. But when she slips out to hear a street singer and gets lost, she gains new confidence and feels that she has become a new person. 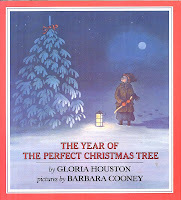 Although this story takes place in Mexico right around Christmas, it's not really about Mexico or Christmas. It's about a young girl's experiences and how she begins to change as she grows up. 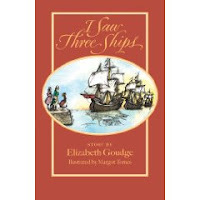 I saw three ships by Elizabeth Goudge, illustrated by Margot Tomes. 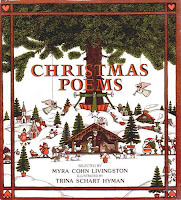 This is a warm and cozy Christmas story. 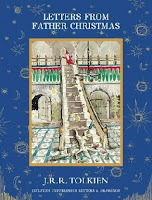 Little Polly, gone to live with her elderly aunts after her parents' death, is determined to honor Christmas custom and leave a door open for the three wise men. Her aunts are shocked and horrified at the idea of doing something so unladylike - and dangerous, for there is no MAN in the house, only THE HAT. But Polly, as always, gets her way and there are happy endings and delight for all as three ships come sailing in. 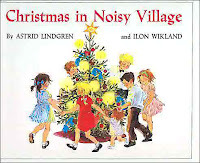 This story is also fairly short in length and would make a nice read-aloud for several evenings before Christmas. It's sweetly old-fashioned and full of warm Christmas spirit. When Arnold Lobel introduced Frog and Toad to the world of easy readers, he set the pattern for a classic format that continues to pop up in easy readers again and again. In my group-Cybils-review today, I have several examples of that format. First, the latest in the Houndsley and Catina saga, Plink and Plunk. This is closest to the F&G model, with two animal friends who enjoy doing things together but sometimes have differences. 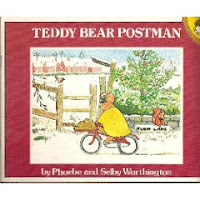 The illustrations are swashy with lots of blues and greens and the different animal characters are beautifully drawn. This is labeled as a "level 3" at my library, roughly 1st/2nd grade. Verdict: A classic series that beginning readers will enjoy. 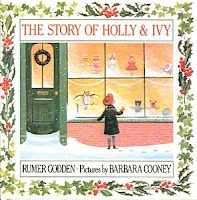 Our next story has a similar reading level and follows the F&G model as well. Cork and Fuzz, a muskrat and opossum, are good friends. But in Finders Keepers, Fuzz's love of collecting causes a problem when he insists on keeping Cork's green stone. 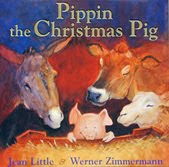 Another cozy animal friendship story, pretty much the same reading level as Houndsley and Catina. My favorite, favorite part is the illustrations. Lisa McCue's characters are so delightfully fuzzy without being too cute. The color scheme here is greens and browns, settling in autumn. Verdict: I discovered this series for our library recently and it's very popular! Now, we have something a little different. For the kids who like the classic F&G but want something with a bit more zing, hand out the inimitable Joe and Sparky! Sparky is a stay-at-zoo turtle, while Joe likes new experiences and adventures. 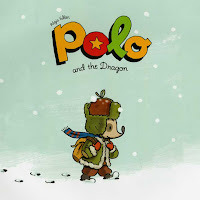 Their wild day out of the zoo is full of silly misunderstandings, sly humor, and the warm friendship of a classic F&G. Kids will enjoy giggling over Joe's innocent enjoyment as he leaves havoc behind him and Sparky's nervous protestations as he tries some new experiences. Verdict: Lots of bright colors, especially yellows, make this wacky easy reader shine on the shelf! Next, we have the Cynthia Rylant adaptation of the F&G with human friends and animal pets. In the latest Annie and Snowball (friends of Henry and Mudge) Annie finds something special: a bird's nest! Rylant perfectly captures the delight and fascination of watching the bird build the nest, lay eggs, and hatch out a family. There are plenty of touches of gentle humor. A warm and friendly story, Rylant easy reader fans will approve! Annie and Snowball is a lower reading level than the previous easy readers we've looked at, a level 1 or 2 in our library (can't remember exactly at the moment) about kindergarten to 1st grade. The second Rylant continuation we have in our nominations, is another addition to the equally popular Mr. Putter and Tabby series. Mr. Putter and his friend Mrs. Teaberry are very different characters, but they do have fun together! Mrs. Teaberry's latest educational and fun idea doesn't turn out quite like either of them expects; but it's certainly fun! Verdict: This is the funniest of the Mr. Putter stories I've read and it's a welcome addition to non-traditional characters in children's literature. The reading level is perfect for 1st through 2nd grade. Finally, we have a nice blend of the F&G and the Rylant Diversion with Cowgirl Kate and Cocoa - a girl and her talking horse. In this story, Cocoa decides to investigate the house; after all, her place is with Kate so she must belong in Kate's "stall"! Some things about the house are nice, but Cocoa realizes she belongs in the barn after all. 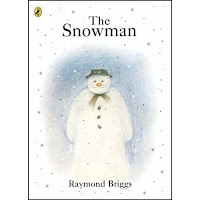 This is a popular series at my library, full of the gentle friendship of an F&G with the added human touches of Rylant and lot of little laughs. The watercolor illustrations bring out the perky character of Cocoa and her faithful friend Kate perfectly. Verdict: Excellent for the horse-loving 1st or 2nd grader. Overall Verdict: And there you have it, six easy readers in the classic pattern! These are all great choices for the beginning reader looking for a fun series to read. The series are excellent quality throughout and perfect for the emerging reader! I'm not quite sure what to make of this book - or where one would catalog it. Each page names a winter sport, gives a brief action sentence, and shows a winter item, usually clothing, but sometimes a piece of equipment for the sport. 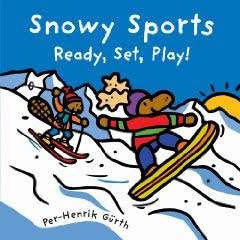 The introductory spread shows various animals getting dressed and the sports listed throughout the book are ice skating, sledge hockey, hockey, speed skating, curling, bobsleigh, skeleton (apparently a type of sledding), luge, downhill skiing, ski jumping, freestyle skiing, snowboarding, and cross-country skiing. 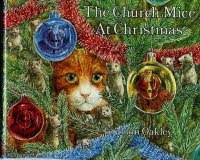 The illustrations are thick and swirling, with lots of bright colors, featuring various anthropomorphic animals. The thing is, while you can get a general idea of what the sport is about by looking at the pictures, if you're not familiar with these sports, it's really difficult to figure out what they're doing. Although I live in Wisconsin now, I grew up in Texas; as far as I can tell, they're all sliding down hills on various implements. I'm sure there's more to it than that, but...the accompanying text doesn't really help; for "freestyle skiing" the text is "Twist and flip through the air!" and the inset box shows ski poles. For "skeleton" (which I looked up online) the text is "Rocket along the curve--zoom!" and the inset box shows gloves. Verdict: What I'm most doubtful about is the audience for this book. An older audience is going to want more facts and information about the various sports. But, as I said above, you really have to know something about these sports to figure out what's going on, and while younger kids may enjoy the animals and the action sentences, they're going to have difficulty figuring out what's happening. 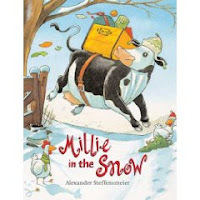 Perhaps it would be useful as an extra book for a unit on winter or winter sports for kindergarten or 1st grade? Good Dog, Aggie is the sequel to Aggie and Ben: Three Stories, in which we meet a little boy and his cute - and often confused - pup Aggie. In Aggie and Ben's three new chapter stories, Ben is struggling to teach Aggie to obey simple commands; sit and stay. Sometimes she gets it; more often she doesn't. Ben's patience and determination is matched only by Aggie's lovable stubborness. There are plenty of laughs but ultimately this is a story of love and perseverance. Frank Dormer's pen, ink, and watercolor illustrations are full of unexpected shapes and colors, from an outragedely orange teacher to Ben's vibrant purple friend Mr. Thomas. Verdict: Equally charming as a read-aloud, this quiet little series has staying power - I hope we'll be seeing more Aggie and Ben for a long time! Well, here we are. Mo Willems. 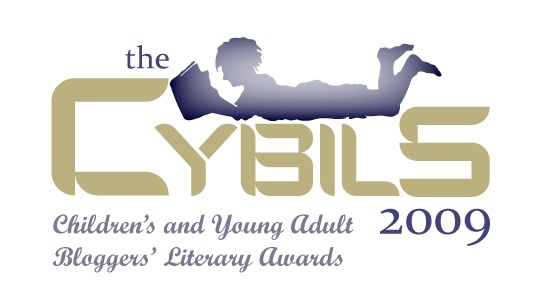 Three Elephant and Piggie books nominated for Cybils. What can I say? I mean, have you ever seen a bad review of Mo Willems? I didn't think so. And this first one here, Are You Ready to Play Outside? Geisel winner. I may not pay much attention to Newberys and stuff like that, but Geisels never go on our shelves....because they're always checked out. Well, I will try. Just in case you thought Elephant was always uptight and Piggie was always flexible and fun....here's Piggie in a rage because of the rain while Elephant knows just how to adapt. Lovely clean lines, humor in each little squiggly eyebrow, and spot-on child voices. Now in this story, Piggie is ready to teach Elephant a new skill. Elephant is not sure this is a good idea; but he's willing to try. And try. And try. Until it just doesn't work! Or does it? Um...I need to say something else. Let's see.....well, on top of recommending Elephant and Piggie to rabid comic fans who want to start their kids out early, kids who want funny easy readers, kids who love Mo Willems picturebooks, parents who love Mo Willem's picturebooks....Elephant and Piggie make great duologues! They're my go-to books when teachers or kids need something simple that two kids can do. The dialogue is all there - all you need to add is expression! Ah, now my favorite. Still my favorite despite having read it twenty or more times at my summer reading promotions last May. I have the whole thing memorized. I can do it in my sleep. Funny voices and all. That delicious moment when the ball plops and the kids shriek with laughter...beautiful. Just beautiful. Verdict: Haven't read Elephant and Piggie? Your life is a barren waste and verging on pointless. These are the rare easy readers that aren't just for beginning readers, they're perfect for all ages. Read them aloud as picturebooks, hand them to an older child on a bad day, use them in your high school theater class, or curl up with a big stack to relax and recapture the wonder, despair, and hilarity of childhood. There are some good bones to this story, but it needs some work. The basic story is a sweet fairy tale. A king, obsessed with puzzles, sets his sorcerer the task of finding a bride for him. The sorcerer discovers a magical puzzle and once the king and his subjects have put it together, it frees the princess from a spell and the king has his bride. 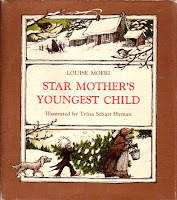 There are only a few illustrations; the cover has a kind of watercolor effect and there are small black and white illustrations at the beginning of each chapter. The story is written in a high fantasy style, which means that some of the vocabulary is going to be too difficult for beginning readers. The descriptions are a bit long-winded and elaborate and many feel cliched. The sections about the sorcerer don't quite fit in with the rest of the plot and there are several loose ends; why is the sorcerer sad? How does the kingdom run if everyone sits around putting together puzzles all day? But, as I said, there are possibilities in this story! The basic plot of a king finding his princess by putting a puzzle together is intriguing and the side plots of the sorcerer's books are fun and light-hearted. Although the language is a bit convoluted and lengthy, the author has some good turns of description and and plenty of imaginative sparks. I can see the puzzle king plot making an excellent picture book, once the story has been pared down and with a good illustrator. The sorcerer and his books might be a fun middle grade fantasy with some additions to the plot and more character development. Verdict: I wouldn't recommend this book as is, but I suggest keeping an eye on the author; she has possibilities! This book has a worthwhile motive, making the history of the White House live for contemporary kids. Unfortunately, it tries to do this by giving historical characters contemporary speech and behaviors and tacking a string of historical facts onto an extremely thin plot. Three students are on a White House tour; Dee from the suburbs who enjoys and flaunts her family's new wealth, Jose who lives in a crowded apartment building with his loving family and relatives, and Annie, a recent immigrant from Poland. The tour guide is giving the most boring tour of all time, telling the children about antique furniture and dishes and the security guard, Mr. Flower is on the lookout for any breaking of rules. 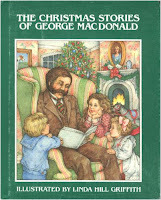 When the three children accidentally knock the portrait of George Washington off the wall, a wild chase ensues with Mr. Flower trying to get him back in his frame as they race through history and meet some of the children who have lived in the White House. They end up helping Lincoln sign the Emancipation Proclamation and seeing the portrait being saved by Dolley Madison. George Washington ends up back in his protrait and the students now have a better understanding, appreciation, and enjoyment of White House. This story is based on a play and while I can see it working well as a school play, as a beginning chapter book it's weak and pounds in its moral with a two-ton hammer. Also, this book hits on one of my rant-buttons for books - putting contemporary language into the mouths of historical characters and giving them contemporary motives and behaviors. Yes, George Washington was a real person; a good biography can give you plenty of information about his life that shows him as a human, not just a hero of the American Revolution. But he'd never say "Hey, I like smiling...It feels good." Sheesh. Verdict: I'd suggest Ron Roy's Capital Mysteries for kids who like historical facts and information mixed into their stories. There are also many, many excellent historical fiction and nonfiction picture books that are a suitable reading level for beginning readers. This is the newest installment in a chapter book series of Batman and Robin's adventures. In this story, Robin is bored at home, procrastinating on his homework while Batman's out on a call, when the alarm goes off. Robin answers the alarm, falls into a trap, and becomes the main event at Harley Quinn's surprise birthday party for the Joker. With a little help from Batman, Robin escapes and they're ready for another adventure! There's a little more character development and interaction in this story than in, say Zac Power, but it's basically the same structure - plenty of fast-paced action, a few jokes, and some familiar characters to entice reluctant readers. Readers will need to know some basic information about the Batman story to follow the plot, but there's a quick bio in the back about Harley Quinn, whom not all readers are likely to know. The illustrations are colored full-page spreads highlighting some of the high-action moments of the story. These are, by the way, NOT graphic novels. I've had multiple people tell me they're comics and they're NOT. They're illustrated beginning chapter books. Just because they're about superheroes and contain colored illustrations doesn't make them a comic or graphic novel. Verdict: These are fun filler reading for superhero fans and reluctant readers. You can also hand them out to parents who don't want their superhero-fan kids to read comics. The Dragons of Wayward Crescent are set in the same quasi-magical world as the popular Last Dragon Chronicles but are aimed at a younger audience. Nine-year-old Lucy and her mother Mrs. Pennykettle live in a mostly ordinary house - except for the dragons. Mrs. Pennykettle is a potter and sculptor and, among other things, creates marvelous dragon sculptures. What no one but Lucy and Mrs. Pennykettle knows is that some are special; some are alive. When Lucy is scared by a mysterious shadow flitting about her room, her mom makes her a special guard dragon. After some initial mishaps, Gruffen catches the mysterious shadow, which turns out to be a bat. With the help of a bat expert and after a few more Gruffen-mishaps, the bats are given a safe home and Gruffen has fulfilled his mission to protect. This beginning chapter book is on the older end of the spectrum, sprinkled with small black and white, slightly cartoonish illustrations, and focusing mainly on the text. Previous fans of D'Lacey may be interested in reading this short stories, but a reader who isn't familiar with D'Lacey's world may become bored by the lengthy explanations of the mechanics. There's a lot of foreshadowing, we'll get to it in another story-ing, and the frightening monster turns out to be another wildlife rescue project for Lucy and her mom. Verdict: Kids who like gentle fantasy reads and animals with a little touch of humor and don't mind wading through a couple slow chapters will enjoy this, but it's not going to grab reluctant or easily discouraged readers. Kids who enjoy this series will probably also eventually like the series for older readers, which is more of the same with a little more drama thrown in. I was just going to read a few chapters before I went to bed.....yawn. Pardon me, but I'm not used to staying up reading until 2am! However, I couldn't resist finishing this fast-paced and exciting middle grade fantasy. Bayang is pursuing a centuries-old bloody mission. Koko and Leech just want to survive. Scirye, in a moment of grief, has made a rash vow to her goddess. Wherever Scirye goes, her griffin Kles goes also. If they want to achieve their goals and destroy the evil dragon Badik and his mysterious master, they must put aside their differences and learn to work together. There's no lengthy world-building or description to slow down the reader; we're plunged immediately into a world similar and yet vastly different from our own, full of magic and strange creatures, from griffins to shapechangers, trolls to walking shark-people. Laurence Yep skillfully weaves his world-building into the adventure and as the reader is pulled along by the action we're fed fascinating bits of information about history, magic, and seemingly mythical creatures. Following the trail of the thief Badik, the group of friends end up near Hawaii, where they will meet a powerful and unpredictable goddess and her allies. Each member of the group has prejudices and fears to set aside; each character must overcome their shortcomings and fear if they are going to survive and be successful in their mission. An afterword and bibliography directs readers to the historical sources of many of the people, events, and geographies included in the story and eager readers will be on tenterhooks waiting for the next book in the series! There's a nice mixture of high fantasy romance and adventure fantasy action which will please a variety of readers. I did feel that the "Cloud Folk" were a bit Oz-ish for the story, but that's a minor quibble. Verdict: Fantasy fans, especially those who like the emphasis on adventure and action, will love this story as will fans of magical creatures and those who like complex world-building that's not too overpowering. Nana, not content to decay into old-lady-hood as her daughter Elaine would like, has found another job - this time as a detective. With the help of her grandchildren, Eufala and Bog, she sets out to solve the case of the candy stealer. Her grandchildren Eufala and Bog. They have some genuinely funny moments, such as when forbidden by their worrywart mother to open the front door "Never in a million years would they have so much as touched the doorknob of the front door. Anyhow, why open the front door when the kitchen window worked just as well--and, they had found, was much less likely to draw the attention of neighbors." Their mischievous naughtiness quickly degenerates into a series of unpleasant and greedy misbehaviors. The illustrations are full of maps, odd items, and caricatured characters. The best and most humorous part of the illustrations are the end-papers, designed to look like want ads. Once you've read the book, you'll realize that some of them are jobs Nana has had which haven't worked out exactly as she planned! Verdict: This book isn't really a mystery. It's a nonsense of irresponsibility. Nana, Eufala and Bog, the policeman, even the children's mother, all act in the most outrageous and insane ways, clearly showing the reader they're not meant to be taken seriously. If you like the weird and wacky with plenty of humor, you may enjoy this quick and kooky read. Hand this out to fans of Horrid Henry and incipient Series of Unfortunate Events readers. Today for Nonfiction Monday, I'm looking at samples from two animal fact series for younger readers and listeners. 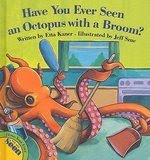 The first, Have You Ever Seen an Octopus with a Broom? is one of the "Have You Ever Seen" series, which compares and contrasts animal and human behavior. This specific volume talks about tools and shows how octopi clean their homes, herons fish, chimpanzees clean themselves, otters crack shells, and more. The text is simple and explanatory, with a repeated form "have you ever seen a --- with a ---? That's silly", then a brief sentence about how a human uses a tool and a short paragraph on the corresponding animal behavior. I wasn't particularly thrilled with the illustrations; they felt dark and forced and the human faces, in particular, were odd. They all have large brown blobs for noses. There is a simple game you can play with the endpapers, but no other additional material or sources. Verdict: If you need more animal fact series for a younger audience, the text is interesting, and others may enjoy the illustrations more than I did. 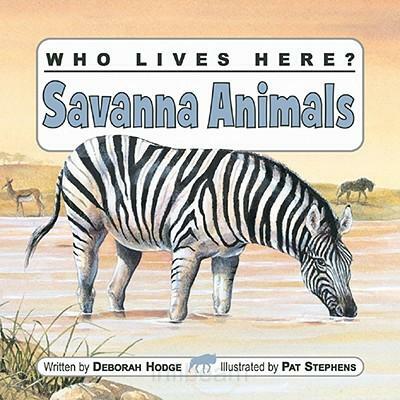 I've seen a few reviews of this second series, Who Lives Here?, which talks about the animals that live in various habitats (I know, they call them biomes or some such thing nowadays, but I grew up saying habitats). I've lusted after the Forest Animals volume in particular, which features a chickadee on the cover. I am very fond of chickadees. I was pleased to see this series definitely deserves the positive reviews and I hope to add the rest of the series to my library soon. 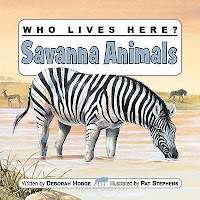 The book begins with a simple explanation of a Savanna then describes a series of animals, including elephants, giraffes, meerkats, ostriches, and the black mamba. There is a simple vocabulary exercise in the back and a more detailed explanation of savannas for parents and teachers. The art is simple but realistic. Each spread shows a large picture of the animal, corresponding with its description, then three small inset circles showing a particular part of the animal and more facts; for instance, the zebra shows a close-up of its teeth, stripes, and a baby zebra. Verdict: The simple text, easily divided, is excellent for use in storytime or for simple homework assignments. Children who enjoy animal fact books will be happy with this simple but engrossing series. Strongly recommended! 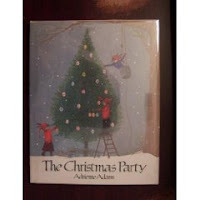 Just in time for a trip to the library before the Christmas rush...here are my Christmas favorites! 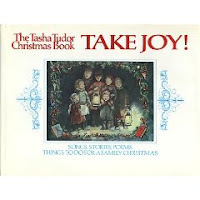 The Tasha Tudor Christmas Book: Take Joy!